PRODUCT DESCRIPTION: This brass extension is much more rigid and won't bend or flex. 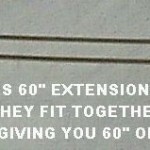 Use it for special application needs since it is a full 60" (5 feet) in length and designed for those hard to reach spots. It comes in two sections which fit together snug and secure.